Arthur and I in Cambria celebrating our anniversary, July 2017. It’s been a while since we have posted to Andrea’s blog. She has recently returned from her annual trip to Cambria, CA where she celebrates her anniversary with her beloved husband Arthur. Andrea originally wrote The Little (Big) Things following her 2014 trip. Arthur and I at the Hero Awards benefiting Friends of Animal Care and Control, February 2015. – We accommodate each other in a balanced way. – We understand one another. What “little things” will you one day look back and treasure? Acknowledge them now, and suddenly they become very, very big. The following is a repeat of a post I made for The Spirited Woman Community in August, just before departing for vacation. While I am in Cave Creek this week, not Cambria, the spirit of “Just Chill” seems appropriate for the holiday weekend. Enjoy! As you read this post, I am officially on vacation. I am in Cambria, California an idyllic haven that offers my family and me a unique sort of respite, a place to “chill out” figuratively as well as literally, given that it’s also a cool escape from the blistering Arizona summer. I strive for peace and quiet amidst the busyness of my life. Yet the world is not quiet. That is not a judgment, rather it is an observation. Whether one is a public servant, a public figure – or even a monk – this “disquiet” can seep into the psyche, creating discord that impacts the quality of our lives and those we care about and interact with daily. In the past, I have written of the importance of rest and renewal. And, as is so often the case, I have observed a theme this past week: A dearth of rest. So many people are starved for a break, for peace and for release. The definition of rest is broad. It can mean temporary cessation from an activity as well as relief or freedom from disquiet or disturbance. Rest includes recreation, and it can literally re-create our outlook, equipping us with renewed drive and energy to use as we choose. Some of us “rest” in motion…through vigorous physical activity, or an active break from routine. Others need stillness and contemplation. The idea of a nap or an afternoon under a beach umbrella may satisfy some and not others. For me, the simple absence of a schedule provides supreme rest. We’ve been resting in Cambria each summer for the last six years. On the first day of our first trip there, Arthur and I were having lunch at a wonderful sidewalk table at a Cambria classic, the Indigo Moon. Our dogs Whisper and Amigo were with us. Just as our server approached, another vacationing dog passed by our table. Whisper, the Malamute, tends to challenge other dogs, and this was no exception. The server looked her straight in the eye and cut her off mid-growl. “Chill doggie,” she said calmly. “This is Cambria.” Amazingly, both dogs “chilled.” From that day forward, time in Cambria came to represent a time to take a deep breath and relax. 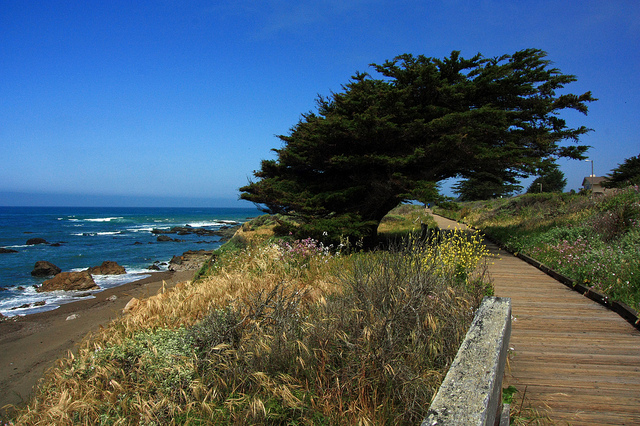 Maybe you too can visit Cambria, in person or in your dreams. Until then, just chill.